Founded before Leicester became a city and still going strong over ninety years later, the LSO is one of our most enduring musical institutions. It was the owner of one of the town’s leading music shops, William Russell, who felt Leicester should have its own symphony orchestra. His rival, Sir Herbert Marshall, proprietor of a large piano saloon in Belvoir Street had founded the Leicester Philharmonic Choir many years earlier and Russell felt that his backing of a new orchestra would give him an equal importance in musical circles. William Russell handed over the detail of forming the orchestra to his son Karl whose first task was to find a conductor. This was easy. There was a brilliant young organist at Melton Mowbray who had transformed the parish church choir and the local choral society as well as charming all and sundry with his vivacious personality. What’s more, he had already conducted one of his own compositions at a London “Prom” concert the previous year. His name was Malcolm Sargent. Russell approached him with the offer to form an orchestra in Leicester. Not surprisingly, Sargent accepted without hesitation. 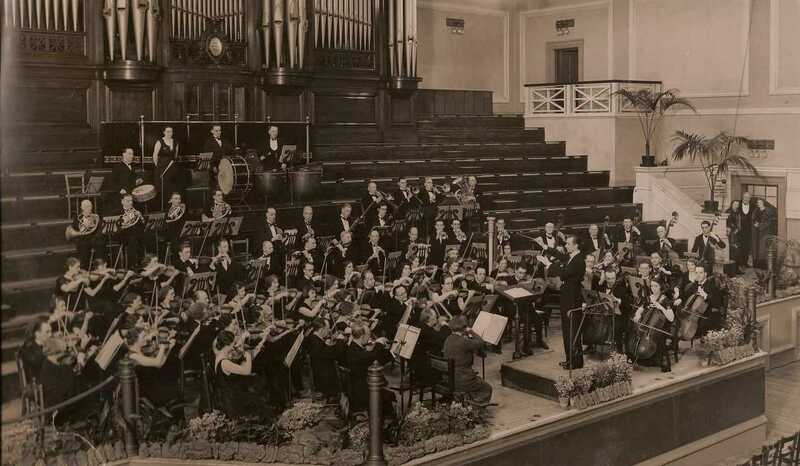 After weeks of auditioning for players (a task he shared with the orchestra’s leader the well-known local violinist and music teacher, Grace Burrows) the first concert of the Leicester Symphony Orchestra took place in the De Montfort Hall on 24th October 1922. The programme consisted of Wagner’s overture to Die Meistersinger, the Gopak from Sorochinsky Fair by Mussorgsky, a choral tone poem, Byron By Joseph Holbrooke and Mozart’s Symphony No. 40 in G minor. The concert was a huge success and the orchestra was quickly established as one of Leicester’s greatest musical assets. Sargent was a tremendous inspiration to his players and before long he had gained a national reputation as one of the most exciting young musicians in the country. He was recording with the major London orchestras as well as with the Doyle Carte Opera Company. This recognition meant that he was able to entice all the leading musicians of the day to Leicester. Cortot, Backhaus, Schnabel, Solomon, Suggia, Rubinstein and Moisiewitsch all performed with the LSO in its first decade. Amazing though it seems now, the orchestra gave Leicester its first performances of two great masterpieces: Beethoven’s 9th Symphony and the Symphonie Fantastique by Berlioz. But it was not just the classics that Sargent promoted, new music by Holst Vaughan Williams, Lambert and Walton regularly appeared on programmes. Sargent and the LSO also introduced De Montfort Hall audiences to the Elgar Symphonies. By the mid 1930’s Sargent was internationally known and regularly conducting orchestras in Europe Australia and America. He was also in demand in England as a choral conductor. In 1931, he had given the world premiere of Walton’s oratorio, Belshazzar’s Feast and shortly afterwards became the conductor of both the Huddersfield Choral Society and the Royal Choral Society. Despite all this activity, Sargent still found time to conduct the orchestra that had launched him on his way. He was its inspiration and the players adored him. In turn, he made them play better than they ever thought they could. He also gave them a chance to perform with the world’s great artists and to make regular broadcasts on the BBC. With this level of music making it was really something to be a member of the Leicester Symphony Orchestra. After the outbreak of war, Sargent was in even greater demand across the country and by 1942, it was really impossible for him to keep his post with the LSO. Reluctantly, after twenty years of outstanding achievement, he resigned as conductor and became the orchestra’s president. Luckily for the LSO there was someone who was more than capable of taking over the baton despite the troubled times. He was the orchestra’s indomitable general secretary and principal oboe, Arthur Thornley. For more than fifty years Thornley was one of the most significant figures in the life of the orchestra and during the war he was its saviour. Not only did he conduct, he also dealt with the administration and even arranged music for whatever combination of players he had when the orchestra’s personnel was depleted due to mobilisation. He not only kept the orchestra going (sometimes under the title of The People’s Symphony Orchestra) but gained some enthusiastic reviews for his musical interpretations. After the war, the orchestra was at a low ebb financially and the number of concerts it gave was reduced. Thornley returned to the ranks of the orchestra and for a short period, his place was taken by the orchestra’s principal viola, Alfred de Reyghere. He, in turn, was replaced by Harry Shaw – a popular and very distinguished local musician who was a professional singer and head of music at Wyggeston Girls’ School. At the same time, Mary Thornley replaced Robert Silvester as the orchestra’s leader – a post she would hold for more than thirty years. Shaw’s first years were difficult financially, but in musical terms he gave the orchestra a new lease of life and introduced a lot of attractive English and French works to the repertoire. Also, after a couple of years of performing in the much smaller Edward Wood Hall, there was enough confidence to return to the orchestra’s natural home, the De Montfort Hall. Harry Shaw was a modest man who was quite happy for others to conduct the orchestra and during his decade in charge, Basil Cameron, Vic Oliver and Eric Robinson appeared on the rostrum and Shaw himself would quite often appear as the baritone soloist. He will be remembered as the conductor who revived and rejuvenated the LSO after a very difficult period both financially and artistically. Due to illness and pressure of work Harry Shaw resigned his post in 1959 and his place was taken by the orchestra’s principal trumpet, Simeon Iliffe. Here was someone who had spent a lifetime in local music. He had been a conductor for more than fifty years, mainly in the brass band world with the Leicester Imperial Band and the Gasworks Band. His experience was invaluable. He knew the LSO players and had been in the orchestra since 1923. What’s more, he was liked and admired by his fellow musicians both for his professionalism and gentlemanly manner. Iliffe was reluctant to take the post but was persuaded by Arthur Thornley who knew he had found the right man. The standard gradually improved until by the mid 1960s the LSO was described by one critic as “probably the best orchestra of its type in the country”. For fifteen years, until he was eighty five, Iliffe directed the orchestra and maintained its standard with names like Jack Brymer, Stephen Bishop, Leon Gooosens, Alfredo Campoli and Peter Katin appearing as soloists. Iliffe died in 1983 and is remembered with great affection. For the next twenty-one years the orchestra was conducted by Keith Smith who did much to broaden its repertoire and widen its outlook. He was supported by the generous financial and practical help of the orchestra’s president, Dr Mac Goldsmith. Keith Smith was a local man and had been the orchestra’s assistant conductor. As with Iliffe fifteen years earlier, he was the right man at the right time and soon began to improve standards and increase audiences. He encouraged youthful talent and during his time many young soloists who have since become international names appeared at LSO concerts. He took the orchestra to new venues, increased the number of concerts and introduced many large-scale ambitious works such as Mahler’s 5th Symphony and Strauss’ Alpine Symphony. Mary Thornley resigned as leader in 1982 but continued to play in the violin section for another decade making a remarkable total of seventy years in the LSO. Both Mary and her husband Arthur made an invaluable contribution to the life of the orchestra. Mary was succeeded as leader by Anne Gosling. By 1995 it was time for another change and after Keith Smith’s resignation the orchestra gave a concert each to three young conductors with the idea of choosing one as principal conductor. There was great excitement after the concert conducted by Roland Melia who was subsequently appointed. Within a short space of time the orchestra began to sound much more refined and balanced. Melia was popular with both players and audiences and was also enthusiastic about contemporary music. In recent seasons the orchestra has commissioned new works to play alongside the classics. As well as a new conductor, the orchestra had a new leader. This was Doreen Adnett, an experienced and loyal LSO player of many years standing. Sadly, due to commitment abroad Melia had to relinquish his post. However, in 2002 the orchestra’s then president, the world renowned oboist Nicholas Daniel, took over as the conductor. His ability and enthusiasm improved the orchestra further, but at the end of 2005 he left to pursue other avenues. Pavel Kotla and others took the orchestra forward in their ninth decade and now John Andrews takes it into its tenth, so there’s no doubt that the Leicester Symphony Orchestra can look forward to the future with excitement and confidence. The LSO plays three concerts a year at the De Montfort Hall. Other activities have included eight foreign tours: Ghent (1999), Strasbourg (2002), Paris (2004), Krefeld (2006), Poland and the Czech Republic (2008), Strasbourg (2010), Paris (2012), Leuven, Belgium (2014) and Reims (2016). The 2010 tour was to mark the 50th Anniversary of the twinning of Leicester with Strasbourg. There have also been highly successful summer open-air concerts for the British Legion in the lovely setting of Beaumanor Hall in the Charnwood Forest. These have commanded large audiences and concluded with fireworks.